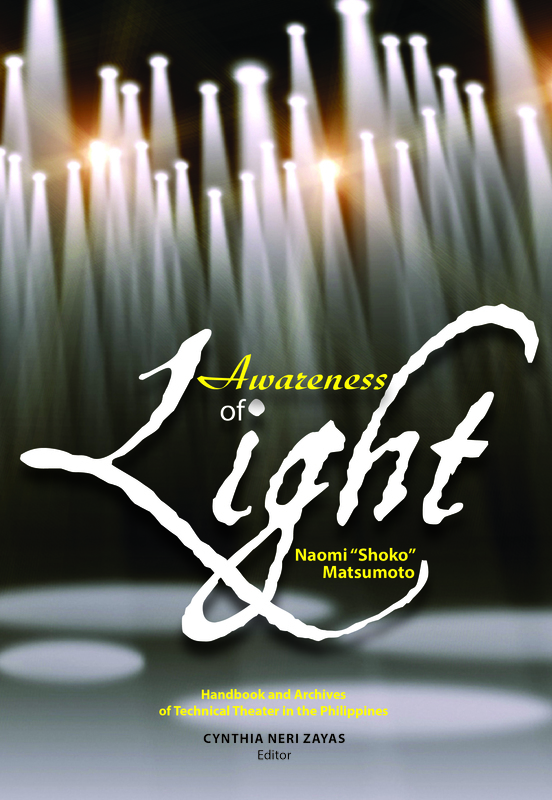 Naomi “Shoko” Matsumoto’s book, Awareness of Light: Handbook and Archives of Technical Theater in the Philippines, is an important addition to the documented genre of lighting design. It brings a uniquely Asian, specifically Japanese, viewpoint and attitude to the discipline of lighting design, including a section on Ikebana and how it relates to lighting design. The book’s approach is international, as are the author and her work, which is clearly presented and illustrated in the book. The information is cleverly organized into Acts and Cues, rather than chapters and sections, and covers the technique and process of lighting design in a clear and practical manner. In addition to lighting, the book presents information about the full craft of theater-making and how each job in theater relates to the lighting designer. I happened to observe one of Shoko’s workshops at Sinag Arts—her workshop and the mode of organizing and presentation are an excellent introduction to the art of lighting design. In addition to the sections on how to do lighting, the book celebrates the life and career of Shoko and the enjoyment of the Philippine culture. The work and collection of Shoko Matsumoto are housed in the Technical Theater Library and Archives of the University of the Philippines Center for International Studies. A list of the holdings is included at the end of the book. Everyone calls her Shoko. It is a Japanese nickname meaning a “lighting girl.” Naomi “Shoko” Matsumoto is an active international lighting designer who has designed for more than 500 theater performances, musicals, operas, and dance productions in the countries in Asia like Taiwan, Japan, and the Philippines, a number of countries in Europe including the United Kingdom, and the United States. She is a member of the Japan Association of Lighting Engineers & Designers. In the Philippines, she is the founding member of Sinag Arts Foundation. She is also the founder and the director of Technical Theater for Aspiring Asian Women (TTAAW). Shoko Matsumoto studied Performing Arts at the Tama Art School in Tama Art University, Japan. Her career began as a staff member in the Stage Lighting Staff Co. Ltd. in 1975. She joined Black Tent Theater as a lighting designer in 1978 and studied under renowned theater director, Makoto Sato. After graduating from the Tokyo Electricity Vocational School, she received her electrical engineer license in 1984. In 1988, the Agency for Cultural Affairs of Japan sent her to Europe as an artistic trainee in the Royal Shakespeare Theater, United Kingdom and in the Vienna National Opera House-Austria. In 1990, the Japan Foundation sent Shoko to the United Kingdom for the overseas artist training program where she joined the Faculty of Art and Design/Theater Production at Croydon College as a researcher. Since then, she set off and established her career as a lighting designer in Europe, Asia, and Japan. She also began her inventive lighting workshops on “Awareness of Light” all over the world where she finds there is a need for her lighting workshops. She cofounded the Sinag Arts Foundation, a nonprofit organization offering training on technical theater in 1998. In 2002, she opened Sinag Arts Studio, a technical training studio for theater in Manila, a first one of its kind in Asia, and cultivated many Philipino talented designers and theater technicians since then. In the same year, she worked on a flagship voyage project of ASEAN COCI (Committee on Culture and Information), Realizing Rama, which conducted a world tour. In 2004, she was assigned as a special advisor for cultural exchange by the Agency for Cultural Affairs of Japan. After opening and establishing the Shoko Matsumoto Technical Theater Library and Archives at the University of the Philippines Center for International Studies (UPCIS) in Diliman, Shoko became an adjunct professor of UPCIS in 2010. Right after the tsunami in 2011 which affected the Fukushima Japan Nuclear Power Plant, she reviewed her lifelong work and handed down her stage lighting craft and ideas to the next generation. She is especially concerned about the deteriorating global environment and has decided to use maximized lighting effect with minimum electric power, and she has started to design using LED and solar power. She is currently designing her cutting-edge and environmental-friendly lighting for various cultural parks, museums, public spaces, and interior lighting projects in the Philippines, Taiwan, and other countries. Additionally, Shoko continues her innovative theater technical education and workshops wherever she feels there is a need for lighting and beauty.